In the news, on social media, we are constantly bombarded with messages. 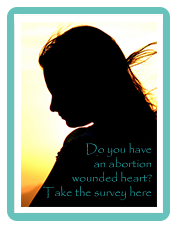 There is no escaping the articles, opinions, and even blog posts about abortion and choice. This message may be the single most polarizing on the planet when it comes to discussing our views with our fellow mankind. I get it…the fatigue, the complacency, the scrolling over. In fact, there are times when I get tired. Tired of the fight. Tired of the talk. Tired of putting myself and the truth found in God’s Holy Word out there again and again and again. And I think, enough already. Today I was discussing this very thought with my Father, not my earthly dad, but my heavenly Dad. But then, that voice…,you know, the familiar still small voice that calms our hearts and centers our soul, spoke to my spirit and simply asked me a question. Immediately, I knew the answer. Oh Father, forgive me. No, you are not tired of hearing about it, you are not tired of fighting for it, you are not tired of talking about it. You do not grow weary. You do not lose heart. All this. Life. The unborn, image-bearers created in the image of God are very much on the heart of the Father. No, He will never grow weary of talking about His beloved creation, and how precious they are to Him. His beloved are worthy of our words. Then the Lord reminded me of a picture a friend of mine posted on social media the day prior…a picture her thirteen-year-old daughter had drawn– the picture above. The Lord used the beautifully detailed artwork of a thirteen-year-old by the name of Riley Lord to affirm in that moment that not only are the unborn on the Father’s heart, they are held close to Him, and knit together by His hands. How the Lord loves his children and uses children of all ages to speak His truth. God is not tired of this topic and if He is not, then neither should we nor the church. I would like to share with you about a much anticipated movie being released this week nationwide that every person needs to see. This movie is Unplanned. You can find out more information at https://www.unplannedfilm.com/ . This movie will also shed more light on the truth of this topic. Let us not grow weary in well-doing my friends. Let us stay closely in tune to what is on the heart of the Father, and ever close to what He holds dear in His hands. Father, that is our prayer today, let us not grow weary in well-doing. Father, keep our hearts beating fast in line with your heart. Lord, may we not tire of truth. May we champion the cause of life and be a light sharing your message of truth, love, and the value of Your beloved, those You carefully and lovingly knit together in the palms of Your hands. They are indeed worthy of our words. In Jesus’ Name, Amen. Go to www.GoDeeperStill.org to learn more about the Deeper Still ministry and our healing retreats. You can also find and purchase Karen Ellison’s book Healing the Hurt that Won’t Heal on our website.